The Basler pulse cameras offer good performance at an amazing price, and this model is our favorite. 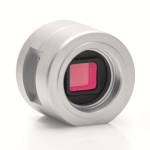 Built on the Aptina AR0134 CMOS sensor, it has 3.75 micron pixels that perform well without demanding too much from the lens. And the global shutter images objects in motion without introducing artifacts. There are no electrical I/O for interfacing with trigger or strobe light. If you need these, please see the ace series.